If you’re fascinated by the mysterious world of North Korea, then Pyongyang might give you a tantalising glimpse. It’s a restaurant chain that is run by the North Korean regime with the sole motive of making money for the government. Those who are less kind have accused the government of using these restaurants to launder money from more illicit activities. There are restaurants in China, Thailand and here, in one of the busiest roads in Phnom Penh, Cambodian. The decor is from a bygone era, fanned curtains, heavy wooden furniture with glass tops… and the women. While others might come for the food, I’m here to check out the waitresses who are dressed in baby doll, polyester pastel dresses. These ladies also sing, dance, play musical instruments and as in my case, very politely tell me to put my camera away – photography and filming is prohibited. I manage to get a short video in and some photos before I’m busted. It’s just a shame I wasn’t able to capture the women dance in perfect formation. 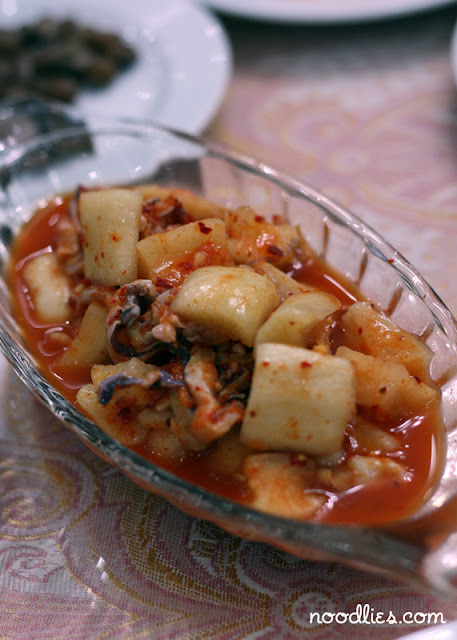 The seafood kim chi was delicious, crunchy, spicy daikon radish with marinated octopus. Surprisingly good. 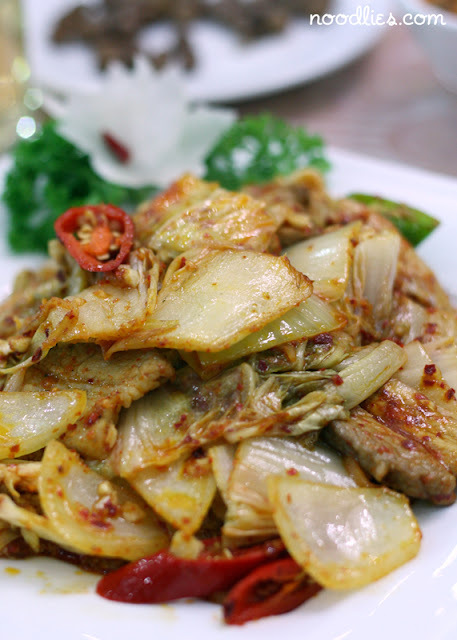 The stir fried kim chi pork is equally classy, the kim chi is aged to my liking, not too old that it becomes acidic and not too young as to lack flavour. 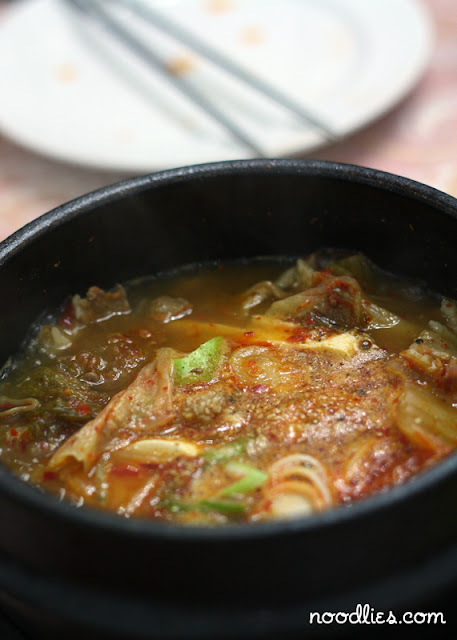 It’s the Kim Chi soup I struggle with, lacking in spiciness or any other type of punch. The flavour is very different from other soups I’ve had and I’ve had a few. It’s definitely acceptable, but I expected more after the first two dishes. But then again, you don’t come to Pyongyang North Korean Restaurant just for the food. It’s an experience that was, well, yes enjoyable, I clapped, smiled and generally egged the ladies on and in the process had a unique and very good time. I did feel the eyes of my waitress on my several times as my hand moved within range of the camera, but she too seemed to enjoy herself as she sang and danced to the delight of the smallish Tuesday night crowd. Watch the video again, and imaging these beautify ladies singing and dancing in North Korean precision. Weird, weird, weird but kind of fascinating in a slow car crash kind of way given how the regime regularly starves their own citizens! Enjoy your holiday. Merry Christmas & Happy New Year to you and your family! It's so true, both weird and fascinating at the same time. Both funny and scary too. I'm so impressed you managed to get photos let alone a video. When I did my tour to the DMZ a few years ago they watched us like hawks so we didn't use our cameras. I'm not a fan of kim chi, but perhaps I've not had a good one. Your holiday sounds great – loving the posts. Wow, very cool. The dresses are so odd!! Oh yeah, the dresses are way odd!